The standard Callaway Rogue iron is expected to make up 50% of their iron sales as it's designed for the everyday golfer. The head is bigger than the Pro, but smaller than the X, and it's packed full of forgiveness. Callaway says it's the hottest iron face they've ever created, with the same levels of flex as a driver over a larger area than ever before. The new microsphere material in the internal cavity acts like a sponge, offering improved sound, feel and feedback in a cavity-back iron. The new Rogue Irons embody Callaway's Rogue philosophy to break away from established protocols in order to develop new ways to extract maximum performance from a golf club. The key technology at the heart of the new Rogue Irons is Urethane Microspheres. R&D experts at Callaway found that high-COR iron faces promoting faster ball speeds are subject to a significant amount of vibration at impact, resulting in a harsh, 'clicky' sound and feel. Inserting a layer of soft material in the head has proven effective at absorbing vibration to improve feel, but with the unwanted side effect of slowing the face. Callaway solved this problem with a new urethane material infused with thousands of tiny air pockets called microspheres, which create porosity. At impact, the microspheres change shape and flatten to create room for the urethane to flex to prevent slowing the face. The urethane also does the job of dampening unwanted vibration that leads to poor sound and feel. 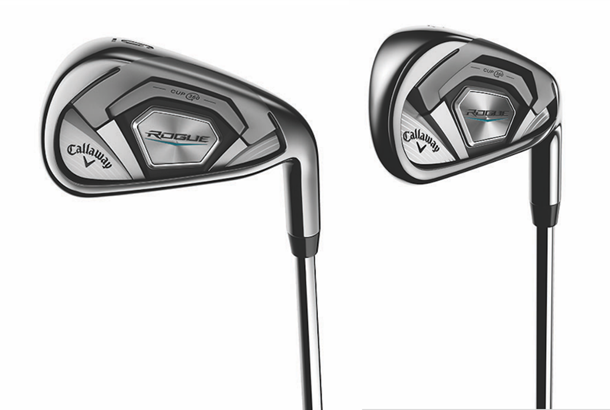 Callaway reckon the standard Rogue will make up 50% of their iron sales as its designed for the everyday golfer. It’s heads bigger than Rogue Pro but smaller than the X and it’s crammed full of ball speed and forgiveness improving tech. Callaway say it’s the hottest iron face they’ve ever created, with the same levels of bounce back as a driver over a larger area than ever before. Callaway’s engineers reckon their new urethane microsphere material in the internal cavity acts like a sponge, improving sound, feel and feedback in a cavity iron like never before. In any other year Rogue would have been Callaway’s biggest selling iron, as it’s pitched right at the golfing masses. Just like Rogue X it blends a big head with a chunky top line and deep cavity back for excellent forgiveness. The issue for 2018 is it’s up against Rogue X which are an absolute beast of an iron. As nice as Rogue are we can’t really imagine golfers buying into them once they’ve hit both sets on a launch monitor and X naturally flies shots further. For those that don’t have the club speed to launch the X’s from the turf, Rogue W should definitely be a consideration. Our test pro saw an extra 4mph of ball speed and 14 yards of extra carry distance with the X, which says everything you need to know. A typical Callaway game improvement iron which boasts of plenty forgiveness and playability. It’s just unfortunate for 2018 it will be out shown and out powered by the lighter, stronger and longer Rogue X.
Dr. Alan Hocknell, Senior Vice President, Research and Development at Callaway Golf, commented: "The technical complexity of Rogue Irons propels performance into the unknown. 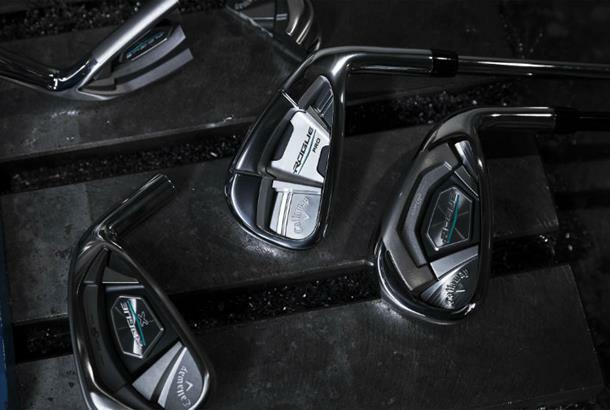 We have created a new class of iron here, beyond anything launched at Callaway before. "The Rogue philosophy is to break away from established protocols and develop new ways to extract maximum performance from a golf club and this particularly comes to the fore in the exciting new Rogue X Irons." 360 Face Cup and VFT Rogue Irons combine our renowned 360 Face Cup Technology with Variable Face Thickness (VFT) Technology to expand the portion of the face that delivers fast ball speed. Face Cup employs a shallow, flexible rim around the perimeter of the face that flexes and releases at impact to increase ball speed. VFT also influences how the face itself flexes to promote more ball speed on off-centre hits. The combination of these two technologies promotes ball speed and distance. The upside of a thin clubface is faster ball speed and more distance, while the downside is excessive vibration that generates an unpleasant sound and feel. Urethane can be used to dampen vibration to improve sound and feel, but it can also greatly reduce the face’s ability to flex, lowering COR and ball speed. Their elastic-urethane microspheres provide the sound and feel benefits of urethane without compromising COR or ball speed. 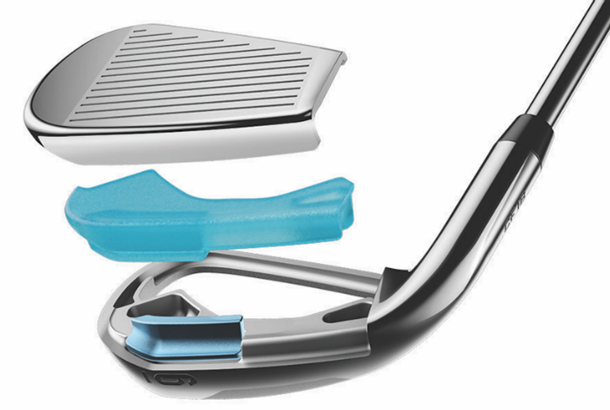 Thin, fast face irons promote faster ball speeds, but they experience a significant amount of vibration, which can result in a harsh, clicky sound and feel. We've solved this problem with something I've called the 'Swiss cheese' effect. By infusing thousands of tiny air pockets (microspheres) into a new urethane material we dampen vibration without slowing the club face. The Rogue's Face Cup employs a shallow, exible rim around the perimeter that exes and releases at impact to increase ball speed. Variable Face Thickness (VFT) technology dramatically expands the portion of the face that delivers fast ball speed, giving you more distance on o -centre hits.